Runner beans need water to germinate but do not need any other special conditions or treatment; they will germinate in the dark (underground) or in the light. The root always starts to grow first and it always grows downwards. The plant is sensitive to gravity and the root grows towards gravity. This is called Geotropism. The shoot always grows away from gravity (negative geotropism). Whichever way up you plant the seed the root grows down into the soil and the shoot grows up to push out into the light. 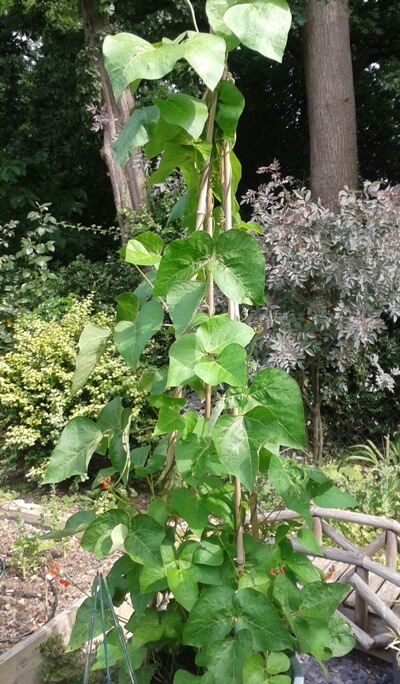 In runner beans the seed leaves remain underground and the first leaves you see are ‘true’ leaves. In many other plants the seed leaves appear above ground with the first shoot and you have to wait for the next leaves to identify the plant. Unlike garden peas, runner beans are not hardy so they are often started off in pots in a frost-free greenhouse and transplanted into their final growing positions once the risk of frost has passed – in south east England usually early May. Beans need support either from a wigwam of sticks/canes or strong netting attached to a rigid frame. What you choose depends on how regularly you grow beans and how flexible you want to be. Each runner bean plant can grow to over 2m tall and they keep cropping until you stop picking or they catch the frost. They are ‘hungry’ feeders to support this amount of top growth and production so the soil needs to be well prepared with plenty of well rotted organic matter to retain water and provide nutrients. In a usual summer you do not need to supply additional water until the beans start to flower. Keep them alive if the weather is very dry or they are growing in a container but too much water early on just means that the plants will grow even taller and put energy into green growth instead of leaves. Once the plant moves into flowering mode, then water well. Feed container grown plants once beans start to form – tomato fertiliser is good as it is high in potash that encourages fruiting. All members of the ‘legume’ family which includes peas and runner beans extract nitrogen from the air and fix it in nodules that grow on their roots. This means that they do not need a nitrogen rich soil or fertiliser. When the crop is finished, cut the plants off above ground and compost them but dig the roots back into the soil to make the nitrogen available to the next crop. Which family of vegetables needs a good supply of nitrogen to thrive? Clue – it helps if you know what plants use nitrogen for.